Willy's life was orderly and planned, carefully directed by his parents...until he went to spend the summer with his eccentric Aunt Bridgett. What promised to be an interesting summer overseeing the making of 37 gorilla costumes became an astonishing summer of adventure and change for Willy! As an only child who normally "didn't like to do a lot of new stuff because he was afraid to," Willy's world was rocked by baseball, music, art, new friends, and crime! From a home of overprotective parenting, Willy had a lot of growing up to do in order to save something he and many others held dear. Will this shy kid find the courage necessary to meet the demands he finds thrust upon him in Gill Park? Will he be able to help a strange new friend overcome a moody nature? What part do dancing fountains, music, and gorilla costumes play in Willy's quest for independence and success? Will he be in time to solve the mystery and save the day? Central Park--Compare Gill Park to Central Park! The Gorillas of Gill Park, is included in Mountains and Valleys. If you would pay $12.95 for our great Kids Wings guide for Crispin that is one of the literature guides in our Mountains and Valleys collection on CD, you will love all 21 guides for just $20 on CD! Click through the titles above and you'll agree that $20 is a great bargain for these lesson plans and activities! But, order soon because this offer only lasts as long as our supply. What Familiar Children's Song was created from Mozar's Variations on: "Ah, Vous dirais-je, Maman"
Thomas Mann: "The way to gauge the health of a civilization is through its music." 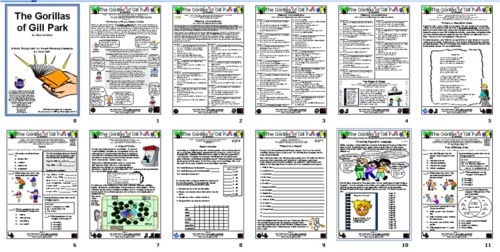 A 21-page unit for The Gorillas of Gill Park by Amy Gordon is perfect for lesson planning, handouts, or projection on your SmartBoard! 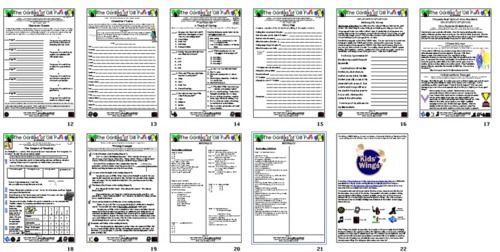 The Kids Wings Download is now available! Buy The Gorillas of Gill Park by Amy Gordon NOW! The Texas Bluebonnet Book Master ListSMwas selected by the Texas BluebonnetSM Award Committee of the Texas Library Association.